Recently we have described about the coarse and fine screen. This article will focus on how to deal with tailing of the first stage coarse screen. It mainly use Light Impurity Separator and Reject Separator. They work together to remove the impurities in tailing slurry and make it clean again. enters in a tangential direction, and rotates along inwall. Fine slurry is discharged to coarse screen pulp chest/agitator, heavy impurities are discharged into the heavy impurity tank. The tailing containing light impurities get together to the hole on the top of Light Impurity Separator, and enter the Reject Separator, which mainly applies to remove light impurities. 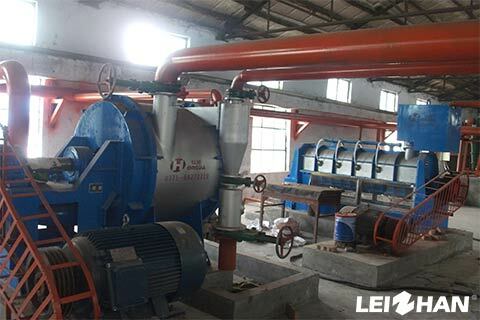 The fine slurry of Reject Separator enter the Light Impurity again from inlet pipe, so that it can be completely cleaned. Waste paper pulping is a complex process, it is constituted by various kinds of equipment, and each of them has their own effects. Sometimes the slurry was handled by the same equipment more then once. One side the paper pulp can be totally cleaned, what’s more, the tailing can be used after ulteriorly purification , which increase pulp quantity and reduce investment.